Please give us a call for Shipping Quote! 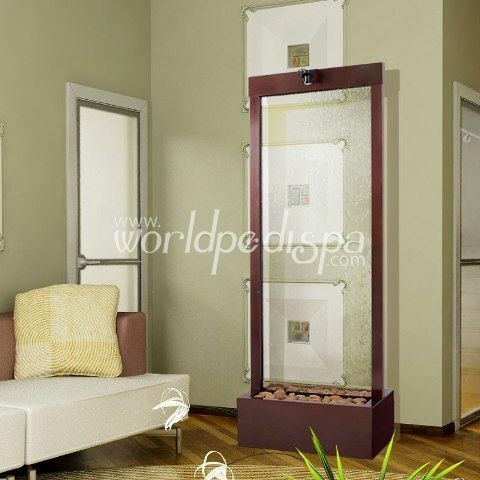 The 6' Dark Copper Gardenfall with Clear Glass adds a touch of modern elegance to any space, indoors or outdoors. The deep, rich color of the dark copper powdercoat finished aluminum frame provides the perfect accent to the beautiful clear glass center. These center mounted water fountains can be admired from the front or the back in your home, office or outside in your garden. If you choose to use this piece to decorate your office, you can have it customized with your logo. It even features a halogen accent light for evening viewing. These water fountains arrive fully assembled, requiring only the most basic effort to install. You should have it up and running in less than 30 minutes with no special tools. The health benefits of a fountain, particularly when used indoors, are numerous. Indoor water fountains can help to clean the air or add humidity to dry air. More importantly, they provide a soothing background sound. The gentle rhythm of water falling on smooth rocks can help clear the mind and cleanse the soul. 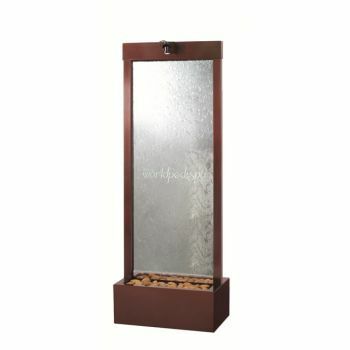 This water feature can be customized with your logo.